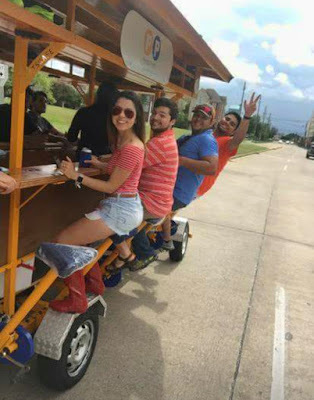 If you've ever been to Midtown and seen crazy people on a weird vehicle resembling a bar on wheels, chances are it was probably a Pedal Party. Those "crazy" people were my friends and I this past weekend. My fiancé and I decided to host one for some of our friends before the Houston weather became unbearable. The Pedal Party is a big trolley that is powered by the riders' pedaling and steered by the driver or "captain." The bikes came all the way from the Netherlands and has been in Houston since 2009. This party on wheels fits up to 16 people and you must be 21+ if alcohol will be consumed. The Pedal Party does not supply food or beverages, everything is "BYOB." You are highly encouraged to bring your own snacks and alcohol as long as it is not hard liquor and no glass containers. There are different routes you can choose from: Midtown, Montrose, Washington Ave, or White Oak/the Heights. We chose the Midtown route and stopped at several of our favorite bars. 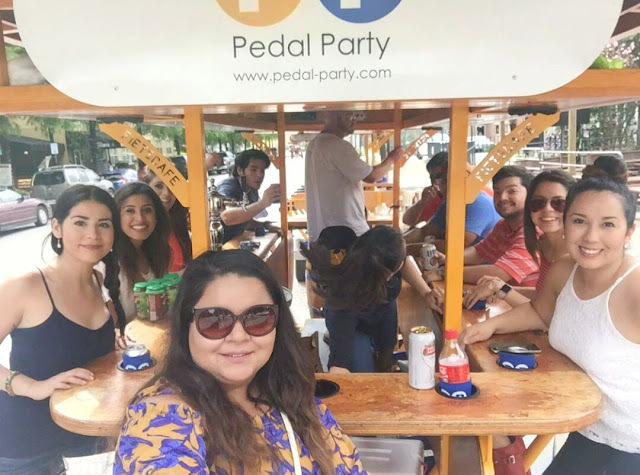 After doing your first ride, you become a Pedal Party "alumni" and can receive a discount on your next reservation. Visit their website for more details and Facebook page for fun photos. Let me know about your Pedal Party experience! !